With just the two of us at home, I usually freeze meat in smaller serves. But I must have gotten a little lazy the last time we did our shopping. The other night I took out some lamb chops from the freezer and there were 8 large bbq chops in the bag! There was no way of splitting the chops without thawing them first and with Umang going away, I couldn’t stomach the idea of eating grilled lamb chops by my lonesome self for the next 2 weeks. So I decided to make a stew with half the lot. 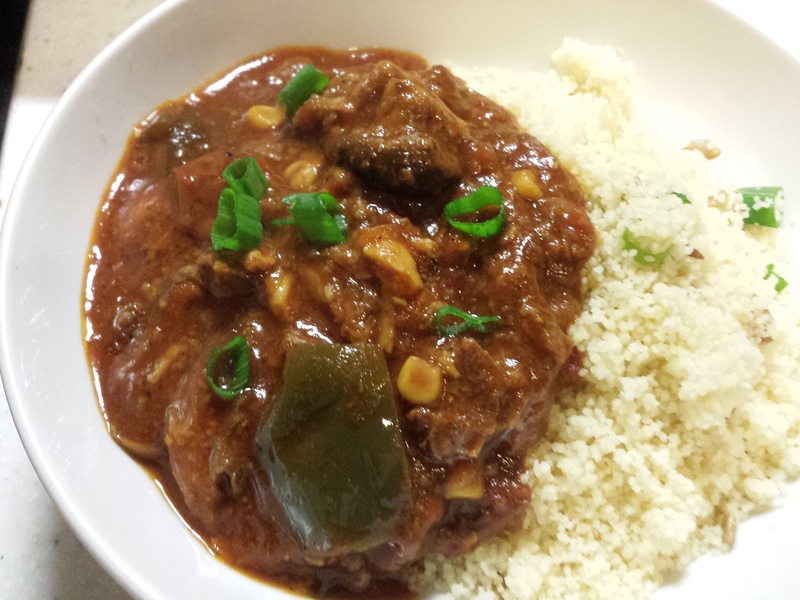 There is very little that is authentically Moroccan about this, but I did serve with cous cous, so I guess that counts? Heat a pressure cooker with a thin layer of oil. Coat lamb chops on both sides with flour mixture and fry in batches until golden brown. Set lamb chops aside. In the same pressure cooker, add a little more oil. Add cinnamon stick, star anise, bay leaf, cloves, mace and stir until fragrant. Add onions, chilli, garlic and fry until onions begin to soften. Add mushrooms, capsicum, corn and tomatoes. Stir well. Add pasta sauce, dried rosemary, paprika, sugar, salt, black pepper and cognac or red wine. Mix well. If the sauce is too thick, add water. You need enough liquid to cover the lamb chops. Return lamb chops to the pressure cooker, cover and lock the pressure cooker. Cook on very low flame for about 45 minutes. After the lamb is done, you can use a ladle to skim off the fat. I also pull out any large bones. Stir well and serve with rice, bread or cous cous. Enjoy!